The Russian Federation has spent billions of Dollars in preparations for the 2018 World Cup tournament, to be hosted in Russia. A good chunk of that budget was spent on stadiums: new constructions and upgrading existing ones, to meet FIFA requirements. The result is nothing short of an engineering masterpiece. It is even rumoured that one of the stadiums gulped a staggering sum of $1.5bn towards its completion. From June 14th, the football fans around the world will start appreciating this huge investment of human and material capital, as the stadiums start assuming their designated role of hosting the World Cup matches. 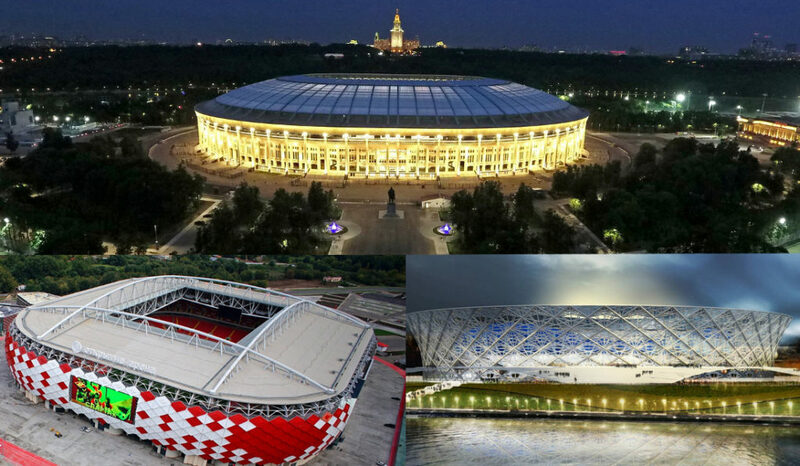 Until then, take a look at the twelve (12) Russia 2018 World Cup stadiums, their costs, capacities, match fixtures, host cities and other interesting info. hint: use > or < to advance one step forward or back, & >> or << to jump to the end or the beginning.